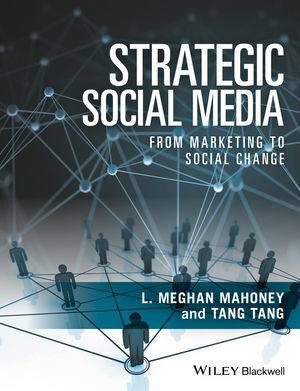 Strategic Social Media is the first textbook to go beyond the marketing plans and how-to guides, and provide an overview of the theories, action plans, and case studies necessary for teaching students and readers about utilizing social media to meet marketing goals. L. Meghan Mahoney is Associate Professor in the Department of Communication Studies at West Chester University of Pennsylvania. She regularly publishes research on issues related to new media audiences, social media, and marketing messages for behaviour and social change, most recently in the Journal of Media Education, Journal of Intercultural Communication, Journal of Medical Internet Research, Journal of Development Communication, and theJournal of Media and Communication Studies. She currently serves as Chair of the Management, Marketing & Programming Division of the Broadcast Education Association, and Social Media Coordinator for the Eastern Communication Association. Tang Tang is Associate Professor and Director of Graduate Studies in the School of Communication at The University of Akron. She has published articles in the Journal of Broadcasting & Electronic Media, International Journal on Media Management, Mass Communication & Society, Journalism & Mass Communication Educator, and Journal of Sports Media. She is a Faculty Fellow of the National Association of Television Program Executives, and has held leadership positions in the Broadcast Education Association and the International Communication Association.